In previous posts I have spoken about the New Buyer and how they differ from buyers of 20 years ago – basically they have all the information at their fingertips to make an informed decision about what you are selling. So what can the “new” sales person offer their customers? Personally, I think we all have to move away from what we are selling and towards what problems the customer is grappling with, and how we can help them solve them. But that’s obvious, that’s what we do today! Well actually when I listen to sale people, 90% of them are still trying to force their “square” products into the customer’s “round” problem hole. They just aren’t listening to their customers and their questions are veiled attempts to position their products and solutions for selling. So, how can we change our approach? I like to use the 4 stages of a customer/supplier relationship to graphically illustrate the point – and actually this makes a great sales team energizer. Individually get each sales person to say where they think they are on the left hand axis with an average customer. Go round the group and mark their answers on a pre-drawn flipchart of the diagram. Remember to challenge people who claim they are trusted advisors – so you work at board level shaping the customer’s future strategy? 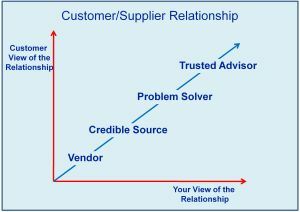 Most people will acknowledge a relationship around the Preferred Supplier level. The question is “where do you need to be in the customer’s eyes to sell more effectively?” My view is that for most suppliers the Problem Solver level is a good level – where the customer values your opinion on problems they have and use you as an independent sounding board. So, the second part of the energiser is to get the group to come up with what actions they can take to fill the GAP between, say, Preferred Supplier and Problem Solver. This is a great discussion point, and can lead to a powerful debate around how the sales force should engage with their customers and prospects. Fundamentally, it is a question of attitude, of wanting to really understand and explore the issues that are key priorities for the customer. Never lead with products, but lead with an attitude of coaching and helping the customer work through their issues. Do you think I am right, or do you have a better engagement strategy – let me know! 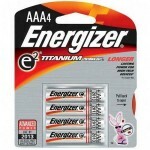 This entry was written by John, posted on June 7, 2010 at 10:46 am, filed under Customer Focus, Training and tagged business drivers, business issues, customer commitment, priorities, questions, team energizers. Bookmark the permalink. Follow any comments here with the RSS feed for this post. Post a comment or leave a trackback: Trackback URL.